Pretty, pendent or outward-facing, saucer-shaped, white with red speckles flowers from February to April and leathery, deep green leaves. This is an attractive variety which is perfect as a ground cover for areas of dappled shade under deciduous trees and shrubs. Like all hellebores they prefer a heavy, neutral to alkaline soil. Reliable, comes back year after year. remove leaves during winter, and the flowers will look even better next spring. Flowers last a decent time. I really like using Crocus - excellent website, quick delivery and healthy plants. This hellebore is a little bit different and brightens the garden in the Spring. Under planting shrubs and to provide winter interest and colour. A beautiful helebour that is a standout plant in the garden. The pure white really lightens up dark spaces and the speckled pink-purple is really useful when pairing with more vividly coloured plants. 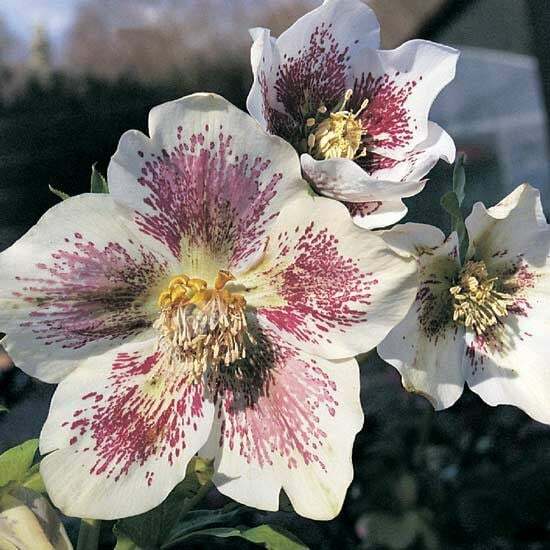 Can I successfully move hellebore plants to another spot in the garden and, if yes, when is the best time to do this - I know some plants don't like disturbance and I don't want to lose them. Hello, These plants have quite a deep root system, so they are not the easiest plants to move - particularly if they are well-established. If you can dig up the plant with as many of its roots intact as possible, then the chances are pretty good that they will survive - although they may sulk for a year or two before getting better established. Dear Plant Doctor Thank you for the information. Once I get back into the garden again, in a week or so, I shall review the "hellebore situation" and make some changes. Many thanks until I contact you again.